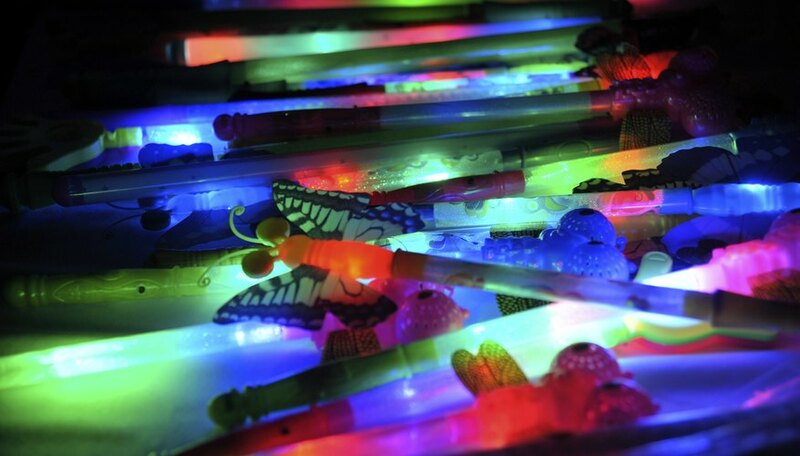 Glow sticks are a fun light toy for both children and adults, and these chemical lights can actually be made at home. With the right chemicals and supplies, you can make a glowing liquid that mimics the store-bought commercial brands. You'll need a number of chemicals -- the more unusual of which you'll need to find online -- distilled water, glass containers and safety gloves to complete this straightforward do-it-yourself project. Prepare your work area by ensuring that it is well-ventilated, free of spills and away from flames. Put on your safety glasses and gloves. Pour 1 liter of distilled water into a glass container. Slowly add 4 grams of sodium carbonate with 0.2 gram of luminol, 0.5 gram of ammonium carbonate and 0.4 gram of copper sulfate pentahydrate. Mix the chemicals thoroughly, and set aside the container. Pour 1 liter of distilled water into a second glass container. Add 50 milliliters of 3 percent hydrogen peroxide and stir well. Put the contents of both containers into a third glass jar. Pour them together slowly to create a blue glowing liquid. The luminol method is a true chemical light. TCPO or bis (2,4,6-trichlorophenyl) oxalate is used to make glow sticks, and its fluorescent colored dyes are made to glow by adding energy. University of Bristol School of Chemistry: How Can I Make A Chemical Light? Mitchell, John. "How to Make a Chemical Light." Sciencing, https://sciencing.com/make-chemical-light-7176452.html. 24 April 2017.